As the Creation Museum approaches its 5th anniversary in May, the museum’s latest high-tech addition was dedicated Friday evening, with guests travelling from as far away as Arizona to attend the special ceremony. The new Johnson Observatory, located on the museum’s grounds in Petersburg, Ky. (near Cincinnati), contains several telescopes, including two permanently mounted16-inch reflector telescopes, which are relatively high power. One of them is of historic value, the Johnsonian Telescope; accordingly, the new observatory is named after the telescope’s inventor, Lyle Johnson. “Because our planetarium programs inside our museum have attracted over one-million guests since opening in 2007, having an observatory with excellent telescopes is a wonderful addition that will enhance the museum experience for our visitors,” declared Ken Ham, president/CEO of the Creation Museum and the museum’s parent ministry, Answers in Genesis. “We will be able to extend our museum operating hours with some specially scheduled evening programs so that people can peer into the heavens. They will observe the rings of Saturn so clearly and the Moon up close, plus see many other fascinating features of our incredibly designed universe. Indeed, as the Psalmist proclaimed: the heavens declare God’s handiwork” (Psalm 19:1). 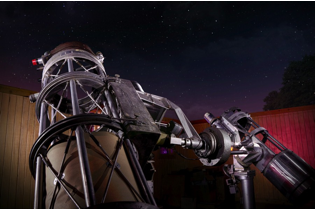 The famed Johnsonian telescope now resides in the new Johnson Observatory at the Creation Museum. Cutting the ribbon at Friday’s observatory dedication was Barbara Johnson Perry, daughter of Lyle Johnson.About 130 people attended the ceremony .Prior to its installation in a specially constructed building with a retractable roof, the Johnsonian telescope was used at a Christian camp, “The Wilds,” in North Carolina. Not having the qualified astronomers to use and maintain the telescope, the camp, with the permission of the Johnson family (Mr. Johnson passed away in 1996), offered it to the Creation Museum. Lyle Johnson’s daughter Barbara Johnson Perry cut the ribbon at the Johnson Observatory’s dedication on Friday evening, with (l-r): Ken Ham (museum/AiG president), Dr. Danny Faulkner (newly appointed director of the AiG observatory and planetarium), and Dr. Andrew Snelling (director of research for AiG). A part of the Johnsonian Telescope is visible through the doors. Other telescopes will be used as part of the Creation Museum's “Stargazer's” programs to teach astronomy from a biblical perspective. The special day and evening events at the planetarium and new Johnson Observatory will be listed at: http://creationmuseum.org/events/. In related news, AiG is announcing the appointment of its new astronomer, Dr. Danny Faulkner. Faulkner will oversee the planetarium and new Johnson Observatory. He will be leaving the University of South Carolina later this year, where he is currently a professor and head of the Division of Math, Science, Nursing & Public Health at USC’s Lancaster campus. 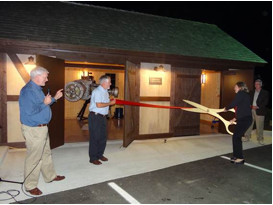 By the way, I want to thank retiring State Senator Jack Westwood and his wife Kelley for attending the observatory dedication and dinner Friday evening. He represents constituents in a large chunk of northern Kentucky—his retirement will come early next year. See the full news article about our friend Sen. Westwood (I think you will find the piece quite inspiring) at this link. Previous Article Protecting the Message of the Gospel Next Article Drowning Atheists?